— The Centers for Disease Control and Prevention has confirmed the first-ever case of Ebola diagnosed in America. — The patient left Monrovia, Liberia on September 19 and arrived in the United States on September 20, CDC director Tom Frieden told reporters on Tuesday. The patient was not involved in the Ebola response in Liberia as far as government officials currently know. He came to the United States to visit family. — The patient had no symptoms upon departing Liberia. Around September 24, he started to feel ill, and around September 26, sought care. The CDC didn't say where, but the man was sent home, it seems his travel history was not taken, and Ebola was not suspected. — On September 28, the man was admitted to the hospital in Texas and placed in an isolation ward. On September 30, the CDC confirmed that this person has Ebola. — The CDC says it has identified all people who have come in contact with the patient while he could have been infectious. This includes "several family members" and a possible "two to three community members." 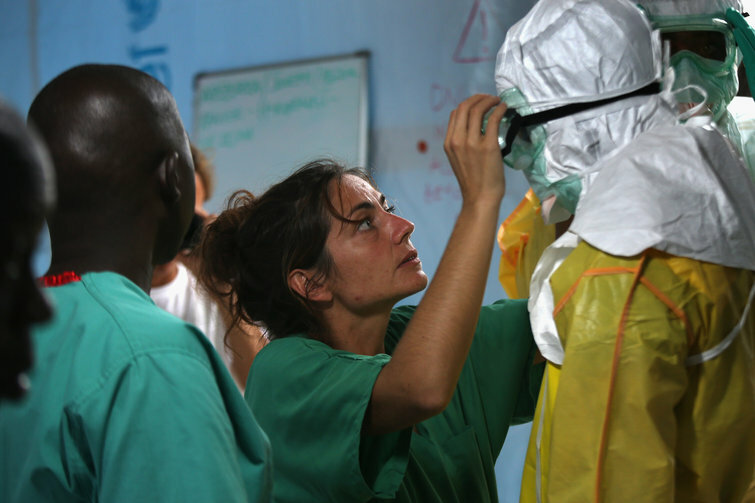 Ebola patients are not contagious while they are asymptomatic. Only someone who is sick can spread the disease. — This Ebola outbreak is by far the largest on record, killing more people and spreading to more countries than all previous Ebola outbreaks combined. The virus has made it to Guinea, Sierra Leone, Liberia, Nigeria and Senegal (a separate outbreak has also occurred in the Democratic Republic of Congo). — Ebola is a difficult virus to transmit and is only transferred through bodily fluids: vomit, sweat and blood. It cannot go airborne which makes it usually containable by sophisticated health care systems. — The Ebola outbreaks are concentrated in low-income countries with incredibly weak health care infrastructures like Guinea and Sierra Leone. Conversely, richer countries like Senegal and Nigeria have managed to contain the disease. The United States has a health care infrastructure that would likely prevent the large, Ebola pandemic that has ravaged West Africa. Other Americans have been diagnosed with Ebola while in West Africa and then brought to the US for successful treatment of their illness. — There is currently no Ebola cure, although doctors have tried different treatments during this outbreak that have varying levels of research behind them. — Whether the Ebola patient is an American. — What type of contact this patient had with anyone else in the United States that could lead to another Ebola infection. — Whether the patient traveled to the United States on a commercial flight. — What symptoms the patient is experiencing right now and the type of treatment he is receiving at Texas Health Presbyterian Hospital.